Here are three sentences whose words do no justice to the majesty of their content: In the depths of a molecular cloud, a star is born. Neil Armstrong walked on the moon. Lionel Messi chipped Pau Lopez in Barcelona’s 4-1 win at Real Betis on Sunday. Lopez, a diligent professional, puts his weight and his momentum on his toes, and perhaps — the second before Messi strikes that ball — he entertains the thought, at some profoundly subconscious level, that Messi might just consider putting the ball over him. If so, it is a thought that he immediately dismisses in irritation. Dear God, Pau, he thinks. Don’t be ridiculous. You utter fool. That said, we must not feel sorry for Pau Lopez. He’s a well-paid professional, presumably rewarded in handsome fashion for the services that he provides to Real Betis. But it’s easy to sense a faint element of sympathy for him. 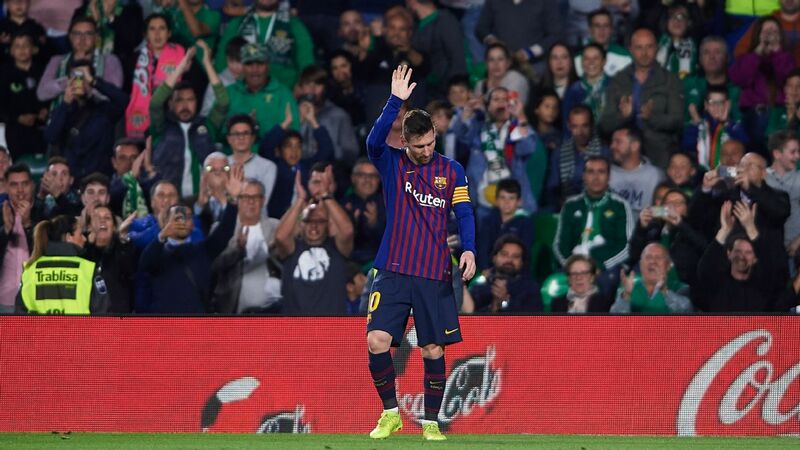 Messi’s magic hat-trick, including an utterly sublime third goal, brought Betis fans to their feet in ovation, even though he’d laid waste to their team. Of course, when Messi did that to him, he did something few footballers can do. If most other footballers attempt that shot, the goalkeeper ends up simply catching it; either that, or the ball drifts harmlessly over the bar. But Messi is obviously nothing like most, if any, of his peers. The chip requires mastery of three specific techniques — spin, precision and disguise — and Messi simultaneously summoned them all. If you watch that goal again, which of course you should, you will see at the instant of impact that Messi had his head bowed, with no indication as to what he would do next. He had cleared the ball for flight, an air-traffic controller plotting its path through the heavens. He then applied the spin — my God, the spin! — slicing his foot beneath the ball at such speed that the motion must have cut the surrounding grass. And, of course, the ball, with the glorious inevitability of our slowly dying sun, rose and fell. Across the Universe, all sentient creatures knew what they had seen. The supervillain Thanos, now resting in his garden at the edge of creation, glanced mournfully upward and lamented: “Dread him. … Run from him. … Messi still arrives.” The home crowd at Betis, though opposed to Messi, made a gesture of the most moving beauty: They rose to their feet in applause, chanting his name. It’s never an easy thing to do when it’s your beloved team on the receiving end, but they had to acknowledge the majesty they’d witnessed with their own eyes. “To transcend” — a verb defined by the Merriam-Webster Dictionary as “to rise above, or go beyond the limits of.” During that passage of play, Messi transcended football. Of course, when he’s off the field, Messi is utterly human: Just ask the taxman. On the field, though, he is frequently supernatural and, against Betis, he was something even more. The Merriam-Webster Dictionary helpfully provides another definition of “transcend” — to be prior to, beyond and above (the universe or material existence) — and we can think, yes, yes, that is it. Messi’s goal against Betis was above and beyond the Universe: It was interstellar. Against Betis, Messi did not merely chip Lopez; he did not merely walk on the moon. As he stood there, as we all admired the ball’s elegant arc, the makers of our night sky commissioned a new star in celebration.